Navarre Properties offers reduced monthly rates for many of our rentals during the winter months. Rates are as low as $1,375 per month (not including fees and taxes) - perfect for snowbirds and those looking to extend their stay in Florida during the winter season. 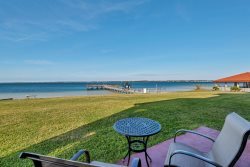 Enjoy a fully furnished Navarre Beach vacation rental directly on the Gulf of Mexico this winter and leave the snow and headaches behind! Please give the Office a call at 866-936-1312 for rates and availability. Navarre Properties wants to "Sea" you at the beach in Florida this winter.